Good news is always good. As I await my gold medal to come by mail, I feel a sense of calm satisfaction, now that the excitement has had time to settle. Two years of hard work at the illustration table that I set up temporarily in the living room to maximize on natural light is now being rewarded with recognition from the prestigious Gelett Burgess Foundation. Here is an excerpt of the press release. Canadian Illustrator and British author Awarded Gold Medal in American Competition. The Tradewind Books children’s book, Aesop’s Fables, has been awarded the 2013 Gelett Burgess Children’s Book Award for outstanding contributions to children’s literature. The book was awarded in the Arts and Letters Picture Storybook category. The Gelett Burgess Children’s Book Award highlights excellence in family-friendly books covering the broad expanse of a child’s existence, helping them grow socially, emotionally, ethically, intellectually, and physically. Each year Gelett Burgess Children’s Book awards are given to 40 books in 4 distinct classifications: Lifestyle, Arts and Letters, Society and Culture, and Education. The list of winners is promoted throughout the year with additional activity and lesson plan resources made available. More information can be found at www.GelettBurgessCenter.org. 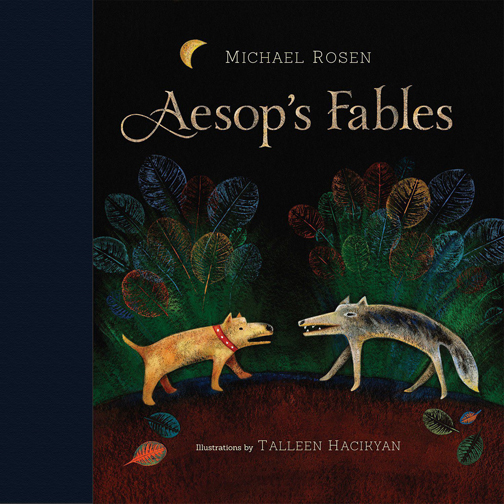 Celebrated children’s book writer, Michael Rosen, collaborates with Talleen Hacikyan in this delightful retelling of Aesop’s most iconic tales, rendered with the author’s signature wit and paired with luminous and enchanting illustrations. A parade of captivating characters–tricky foxes, talking trees and ferocious lions–impart the universal wisdom of this master of the parable. Award-winning author, MICHAEL ROSEN, is one of UK’s best-loved children’s book writers. He was the UK Children’s Laureate from 2007 to 2009 and presents BBC Radio 4’s Word of Mouth. He has published over 100 children’s books, including the best-selling We’re Going on a Bear Hunt. TALLEEN HACIKYAN is an artist, teacher and writer, based in Montreal. Winner of the Loto-Quebec Printmaking Prize, she has been featured in over 85 solo and juried exhibitions internationally.